It seems like something out of a Dan Brown novel: there is a Sheets Studio painting, hiding in plain sight. Last month I visited the Burbank Home Savings branch, and I could tell there was something fishy. On a prominent corner, the three-story structure dominates its site, with ornate sculptures high on the corner, and a mosaic of family life welcoming guests from up the hill. 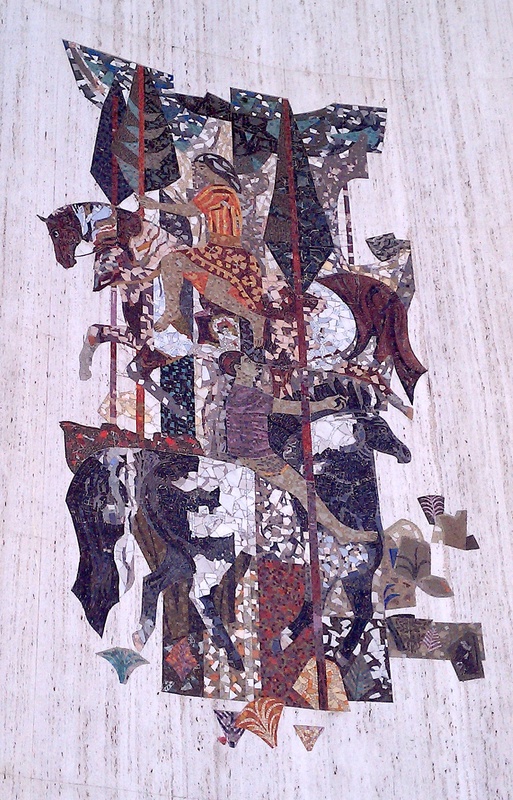 Both works show family theme in full: a family reaching high into the tree, and children on the horses of a merry-go-round, a reference to the amusements of Griffith Park. Though I could not find signatures, it looked like the work of Sue Hertel and perhaps Al Stewart, familiar Home Savings themes. But it was when I went inside that I felt something missing. Like many former Home Savings banks, the large lobby had been subdivided into cubicles, and the balconies enclosed (in mismatching drywall). The travertine here was pinstriped with black lines, and a clock in the original was maintained, directly across from the teller’s windows, but it seemed like something was missing. For such a large, prominent branch, no inside art? And Carrie also knew what happened to it, and had the documentation to prove it. 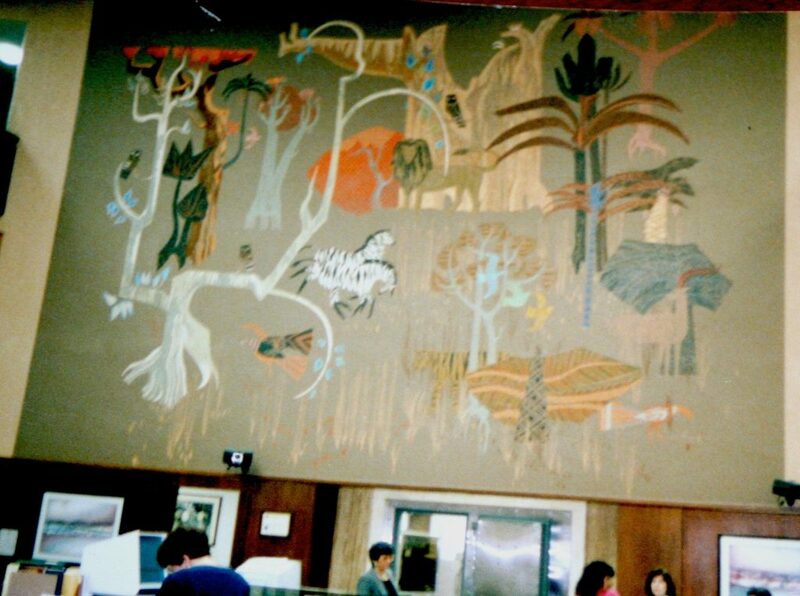 The LA Zoo painting was not destroyed; it was not removed, either. 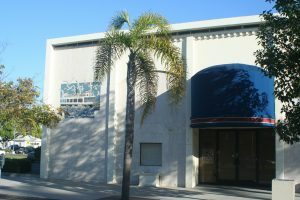 As far as she or I know, it remains in place, for in 1992 the Home Savings branch manager decided to cover it, in a renovation, and Carrie had copies of the specs from TG Construction of El Segundo, who did the work, from new paint and some window replacements to the order to “cover existing art work, approximately 24′ x 24′, at bank lobby area.” The plans show the drywall and studs used to protect it. 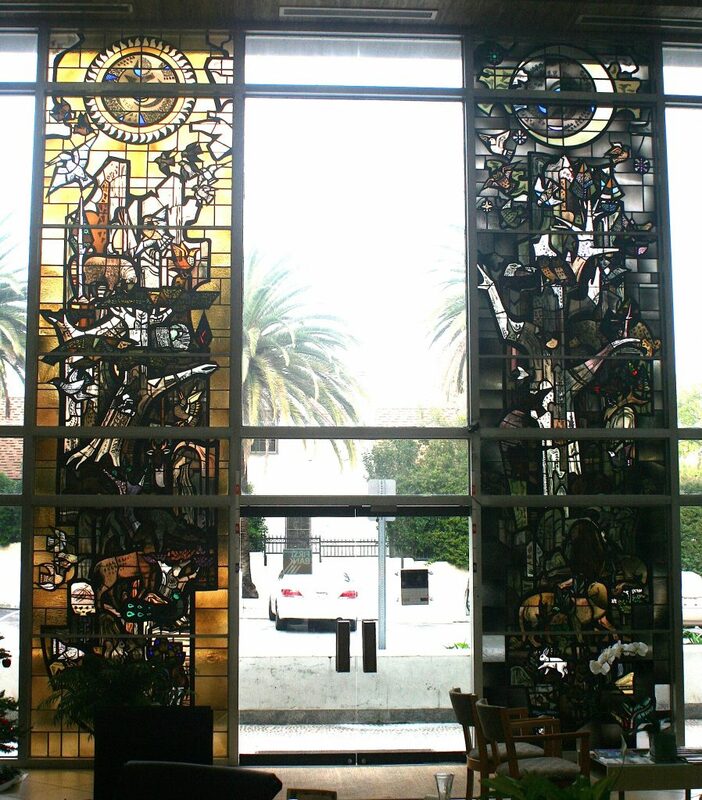 Those involved must have assumed this was their only choice, but as Tony Sheets has proven at the San Jose Airport Terminal and elsewhere, the paintings were almost always done on canvas, and hence they can be popped off the wall and rolled up, as needed. Carrie said she mentioned this to the Washington Mutual, and then the Chase managers; perhaps this new announcement could get it uncovered, either for display in the bank, where it was intended, or at a nearby museum that also celebrates California and the West, Griffith Park, and the community — the Autry National Center. Happy 2011! The definitive list of Sheets Studio public buildings is coming a bit slower than expected, but the addresses and status of the 200+ sites I have identified will be available in January. The same day I visited the Wilshire Blvd. Scottish Rite Temple and the first Home Savings location at 9245 Wilshire, I made it down the block to the Ahmanson Bank and Trust location (now First Bank) at 9145 Wilshire. 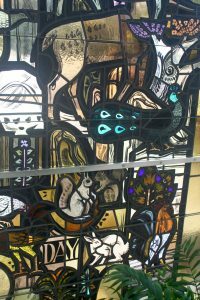 There is remarkable exterior art–mosaics and sculpture, soon to be restored–which I will describe another time, but this week I finally made it back with permissions to take photographs of these large stained glass windows. The bank manager, Jeremy Sarkissian, is enthusiastic about this history of this bank, and he provided images of what once was — fountains, sculptures, and more. 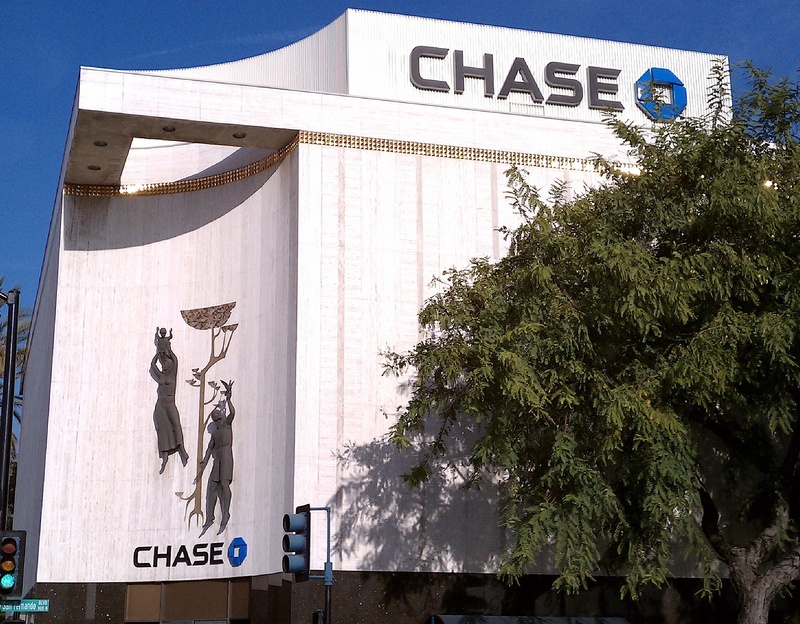 But the bank — with a wide opening entrance space, an unusual round elevator, and mosaic elements around the vault–still shows many signs of its Sheets Studio heritage, even before renovations. 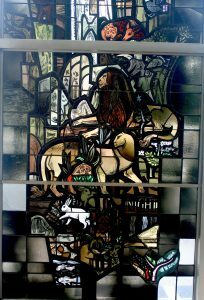 These wonderful large stained-glass windows provide quite a contrast to the history of banking one block west. Filled with animals, gathered around a tree reaching up either to the sun or the moon, these windows show a vibrancy that hints at the choices that Sue Hertel made to enliven the projects with bright colors, a greater variety of animals, and a sensibility of animal arrangements and poses that suggest family intimacies, rather than static poses. This project was documented while under construction by American Artist, showing most of the artists at work. 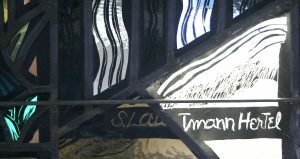 And the signature–S. Lautmann Hertel–indicates a moment of transition in Sue Lautmann Hertel’s life, when, newly married, she was signing these works with both last names, before switching to Sue Hertel for the rest of her life. In the past few weeks, I have had the chance to visit many new branches and museums; the results should be appearing in the months ahead. But for next week, I plan to offer a new definitive list of Sheets Studio projects in public buildings; check back for a New Year’s treat! 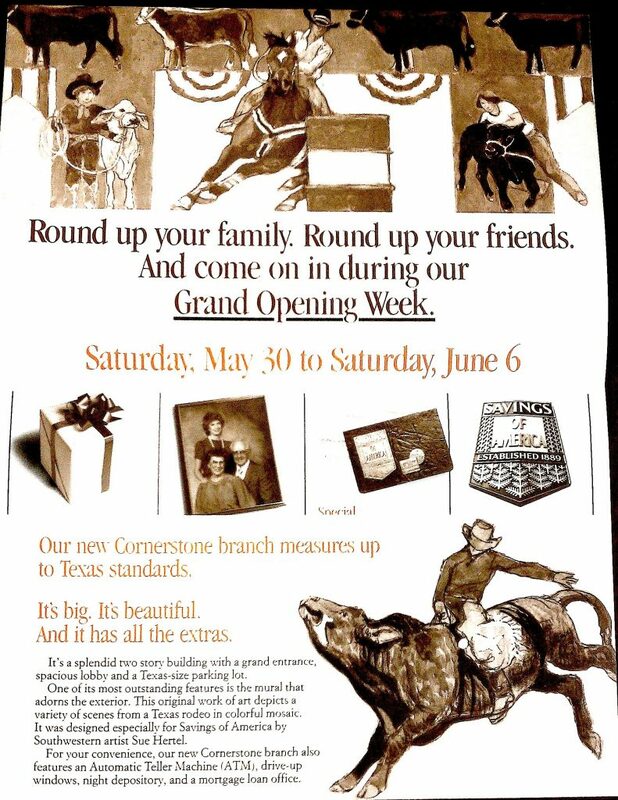 Come on down for the Texas-size grand opening! “Savings of America” (one of the national names used, because Home Savings of America was taken in Texas) invites you to see the new artwork by “Southwestern artist Sue Hertel”! We are only twenty-two and a half years late — are we still eligible to win the Polaroid Sun 600 camera? 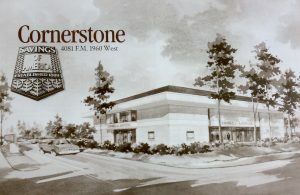 In these weeks when I am not commuting to Texas, I do find Texas popping up all over, including in the announcements for the Cornerstone branch, somewhere in the vast landscape of Houston. As you can see, these later banks (in Texas, Florida, Illinois, and elsewhere) attempted to provide for the local community the sense of celebration and, at times. history that the original California branches did. Sue Hertel was living in Cerrillos, New Mexico, at this point, sending artwork back to Denis O’Connor in Claremont, so southwestern is probably an appropriate moniker as well. This bank is still standing — take a look at the Google Streetscape image — and the expansion of Home Savings to Texas actually returned Sue and Denis to the state where some of the most magnificent early work of the Millard Sheets Studio, in the Mercantile National Bank of Dallas. 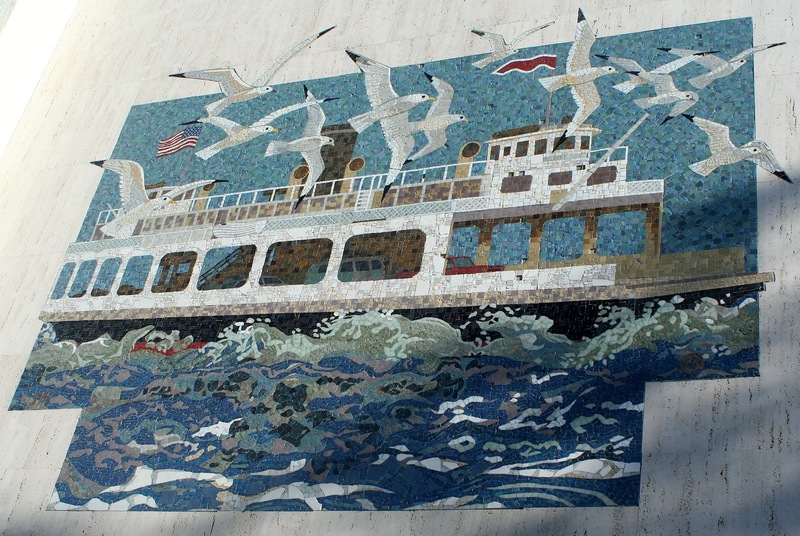 A group of local preservationists and businessmen saved those images, finding a six-figure donation to pay for taking out the mosaics. You can read a bit about it here, but that will be a Texas-size effort to discuss another time. O.K. lurkers, all of you who view the site but never write comments. I know you are out there — the website stats tell me so. Here is your opportunity for end-of-the-year redemption. And it won’t even require opening your wallet, like all those mailers and pledge drives. Last week I had a chance to meet with Janet Hansen, Deputy Manager of the City of Los Angeles’s Office of Historic Resources. We discussed the progress of SurveyLA, a massive building survey out to find out what remarkable (or unremarkable) structures exist within the city boundaries–iconic office buildings, private homes, apartment-building types, gas stations, theaters, all of it. She was aware of the Home Savings buildings, and we have discussed the existing lists of branches, either from the mid-1980s or today. 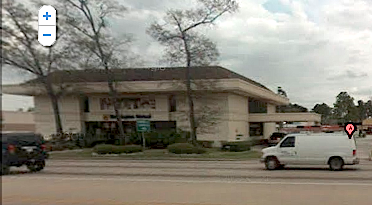 But of course merely having been a Home Savings branch does not mean the bank location has (or even had) artwork. She asked me a question I want to start to answer here, with your help: What architectural details, colors, media, size, signatures, or other character-defining features make these Sheets Studio buildings special? 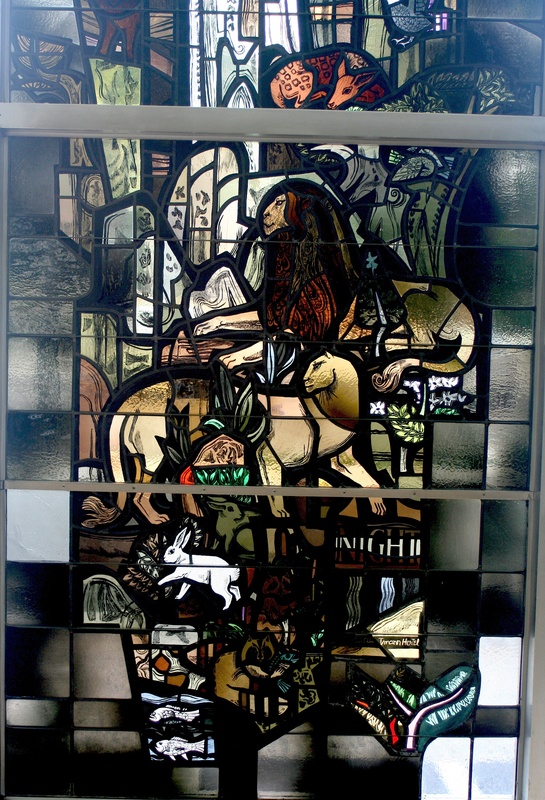 Some of the banks were conceived in their totality by the Sheets Studio; others merely received mosaics, murals, sculptures, and/or stained glass, attached to existing buildings. Some received only the projecting cornice and row of gold tiles around the top, and perhaps the travertine facing on the most public side — no real Sheets Studio work, other than to match the most basic elements of the more iconic designs. Below is my list, roughly working from the most obvious to the more subtle. What would you include? Once we have a good list, Janet can get it into the hands of the SurveyLA surveyors, and help to identify and preserve these buildings. That is what I find to distinguish these buildings; anything I have missed? On Thanksgiving Day, while my toddler napped, my father and I drove over the San Diego-Coronado Bay Bridge to take a look at the former Home Savings (and now, former Petco) at the center of the business strip on Orange Avenue in Coronado. When I first heard that a former Home Savings had become a Petco, I couldn’t figure out how that could be; thinking about the kind of grand lobby in the original banks the Millard Sheets Studio designed for Howard Ahmanson, I could not figure out how that would work. When I arrived to see this building, however, it made a bit more sense — in part because this was hardly a typical Home Savings building. It was a corner property on the main business thoroughfare, with a sizeable parking lot, but the site had been misused by those that built it; the corner was given over to parking, and the building — not, clearly, built as a bank originally — squeezed into a row of storefronts. 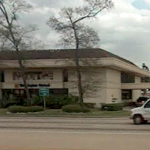 It had been a not-very-prominent bank, then a too-small Petco; now it sits empty. The artwork, which my files can date to 1985, is small, a modest addition to this preexisting building. But the work does hold some of the earlier themes — a joyous and iconic local experience, crossing the commuter ferry to San Diego — and a few seeming technical innovations. As I noted a few weeks back, Alba Cisneros had described the difference between cutting the travertine around the small elements at the edges of a rectangular piece of artwork vs. finding ways to “cheat” it, by using broken travertine like mosaic pieces or simply staining/painting those edge details onto the building. 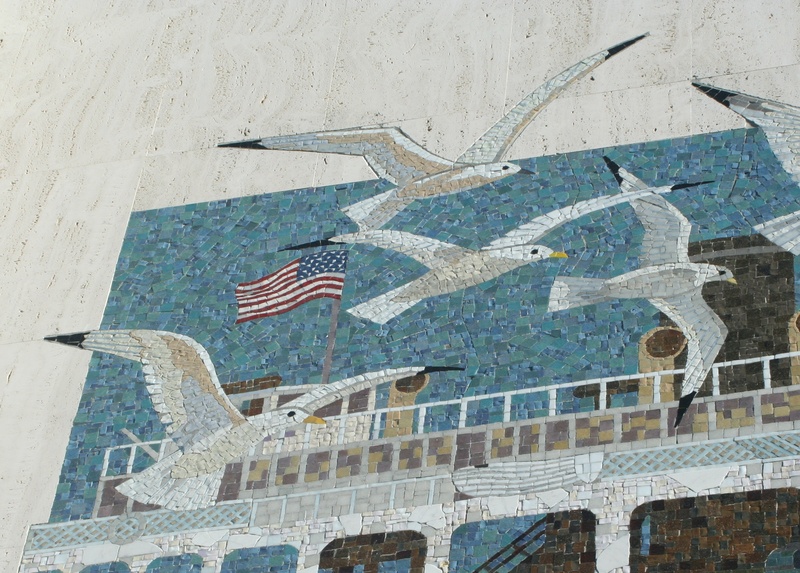 Despite the late date of this work, Hertel and O’Connor nevertheless were able to carefully cut the travertine to match up with the gulls’ wings, a few matching the rectilinear lines but the one at the center top bolding taking its mosaic wing at an angle, at great cost but greater beauty. Even though the color palette of this mosaic is lesser — fewer offsetting Color Field-like choices — the craftsmanship on these tiles on planar surfaces — the sky, the rocks, the birds — seems unsurpassed, so dynamic and intricate, compared to some of the earlier compositions. A nice sight to see over the holiday, and a nice reminder the questions of complexity, cost, theme and color do not simply rise and fall in the history of this artwork.